There is truly no other curry book like this one. The recipes are not the traditional cuisine practised by Indians at home but the distinctive and well-loved variety served in Indian restaurants worldwide. 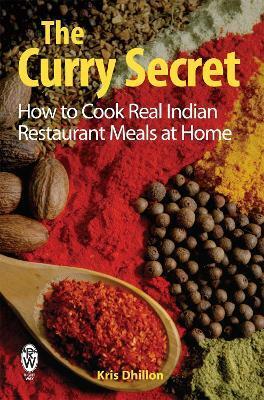 Since its first publication nearly twenty years ago The Curry Secret has been a bestseller. It has grown, by word of mouth and reader recommendation, into a cult classic - it has even spawned internet forums where readers rave about the sauce. Following requests from those readers, Kris Dhillon has now updated the book to include a wider choice of dishes and brand new recipes for even more mouthwatering curries as well as all the established favourites. From Chicken Tikka Masala to Onion Bhajee, Aloo Gobi to Lamb Biryani, everyone's favourite is here. Kris Dhillon writes with the authority of an accomplished Indian restaurateur. With many years of experience and thousands of satisfied customers she is still flattered by the popularity of her recipes and by the volume of interest and debate they continue to provoke.